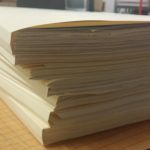 Home › From the Stacks › What’s the Big Deal with Professors’ Fonds? What’s the Big Deal with Professors’ Fonds? Some of us students have this funny idea that professors are bound behind thick round glasses and pile upon pile of corrections due in a week or so. And while this statement is not exactly untrue, it is not entirely correct as well. In fact, their institution actively encourages them to leave the school as much as possible! But let us take a small step back and ask ourselves what is a professor: is it not the same as a teacher? Well, it goes this way: Quebec is in Quebec, but not the other way around. Let me phrase it otherwise: the city is in the province, but not the other way around. Following this logic: a professor is a teacher, but a teacher is not necessarily a professor. While the value of a teacher’s duties should not be lessened by the following distinction, it is important to note the difference if we are to go forth in this path. In the course of their lives, professors usually travel around a lot, meet with a variety of people from all across the country and the globe, publish impressive amounts of material like books or articles. But after their retirement, what do all these accumulated records amounts to? I believe that in explaining what the value of a professor fonds is, two lessons can be learned. Firstly, that they are vast and varied in their shape and content, which allows researchers for a much broader understanding of their complicated lives; and secondly, that the professor who will be teaching your next class is probably an international superstar without you even realizing it. 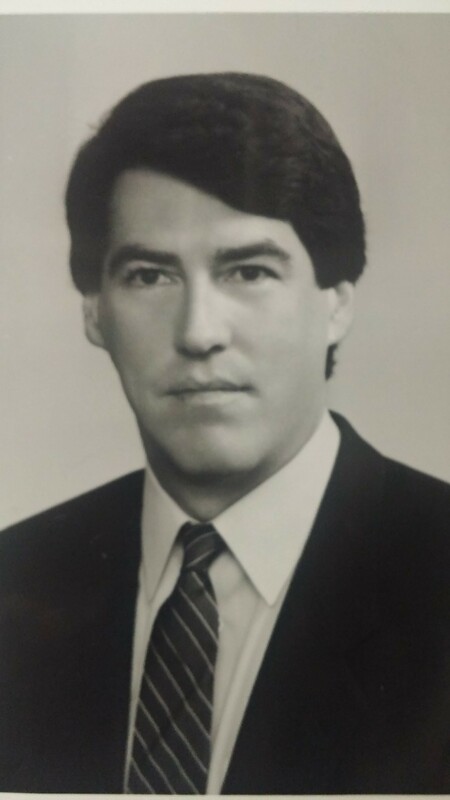 William G. Watson, May 1985. By Van Dyck & Meyers Ltd.
For the sake of this exercise, one must only look at one of our most recent acquisitions: the William Watson fonds. 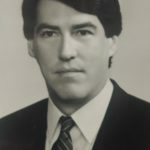 The titular creator of the fonds has taught economics at McGill Economics for 40 years and wrote countless articles for the Financial Post and the Ottawa Citizen. Those are the surface level details you will find, but if we go deeper, we will soon see how full a professor’s life can actually get. If we take a year at random, say 1990, we will find that Mr. Watson, according to our holdings, published 2 articles and 1 paper; attended to 2 lectures, 2 forums, 6 meetings and 2 seminars; gave 10 interviews and 3 presentations; taught 3 courses at McGill; was part of a series of boards and committees; and received 3 cm of correspondence. These may seem like small numbers, but one has to consider the work it takes to prepare a course, a paper, a presentation, etc. Imagine if, by next year, you had to prepare at least 20 oral presentations, to compose 3 written works, to build up enough material for 3 courses and be an active member of at least 5-6 committees or boards. Added to all this work, you must also keep a healthy correspondence with colleagues and friends alike. This represents a good 32 files of content for a single year! result of a rain of records that could not be stopped for decades on end. 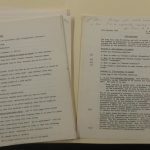 While processing what can sometimes be great volumes of professor archives, a question arises immediately: how can I make sure I won’t erase the initial complexity of their lives? Still, with Professor William Watson fonds, answers could be found for that question. 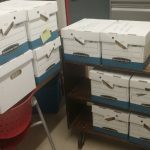 The McGill University Archives (MUA) received 16 boxes from the fonds’ creator, which amounted to a total of 5.05 linear meters of archives. The length of kept archives is impressive, to say the least: 2.23 linear meters. That represents only 44% of the original donation! Simply because of our “raincoat” or, as we call it, sorting criteria. Now, creating criteria for private fonds has been a scholarly debate for at least three decades, and while the MUA built its own answers to the problem, it did not solve the issue entirely; it only made processing these records easier and less threatening. In fact, many American universities have done the same, having built adapted sorting criteria. Adapted is the keyword here, since the goals of one archival centre do not necessarily correspond to those of another archival centre. For example, we, at the MUA, accept records of all formats (as stated in our terms of references), but other archival centres might not be so lenient. There is a saying that states that if we were to suddenly lose all Christian texts except one, only the Sermon on the Mount would be necessary. 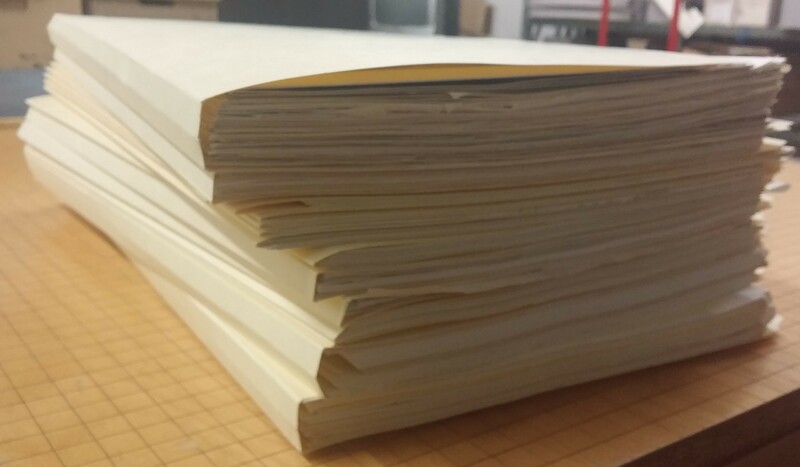 With that in mind, an archivist’s duty in processing an acquisition is to keep only the strict minimum. When it comes to a professor fonds, one fundamental goal comes to mind: after the processing, researchers should be able to tell anyone, with only the help of a simple glance, who was that person and their profession. The sorting criteria, in such cases, are an essential tool built from two sources: the archival team’s judgment and the MUA’s mission, the latter certainly governing the former. But another factor comes into play: the donor. 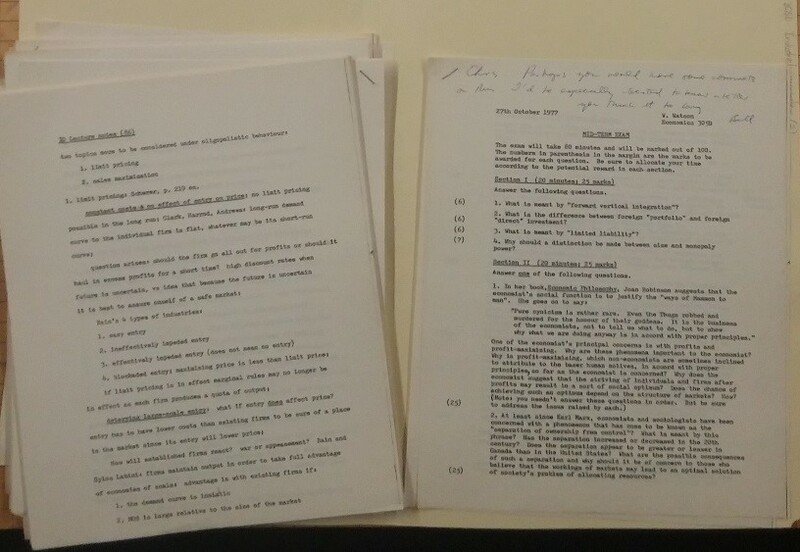 Some donors who retire and gift their archives to the MUA work closely with the service in order to make sure that no crucial archives are rejected. After all, nobody knows their own life better than themselves. In that regard, a note could be added to the saying: archivists get to say what is history or not, in which we could state that the donor, a professor who has influenced the history of its field, can also influence its own prosperity through his archives and through how they are handled during the processing. 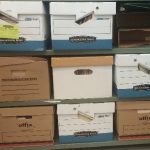 A collaboration of this sort not only, as stated earlier, saves archives that would have been lost otherwise, but makes finding aids more complete and accessible. Exactly what archives can we expect from a professor fonds? 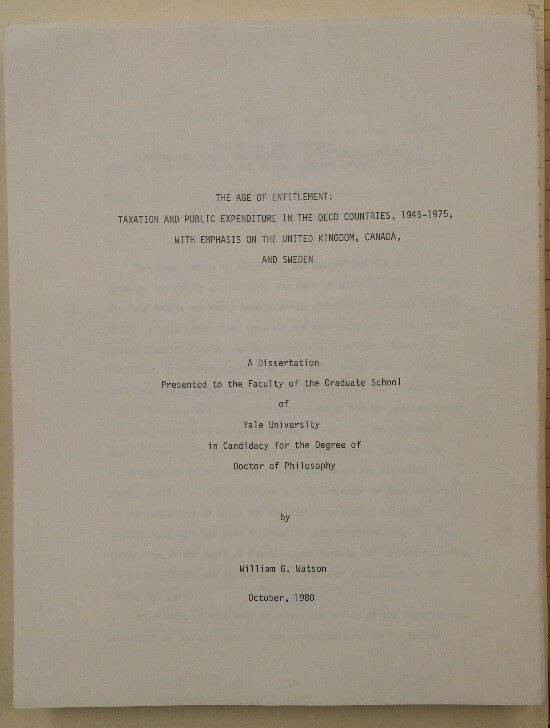 The list is very long, but if we review Mr. Watson fonds, which is typical of professors fonds, we can see that all book, article or paper drafts occupy 29.4% of the fonds; material related to public addresses such as speech notes, prepared papers, promotional material, amount to 8.6% of the fonds; course material related to his teaching career at McGill, such as syllabi, lecture notes, examinations and so on, makes up 30.8% of the fonds; and correspondence, which is mainly built from letters and postcards, represents 16.7% of the fonds. 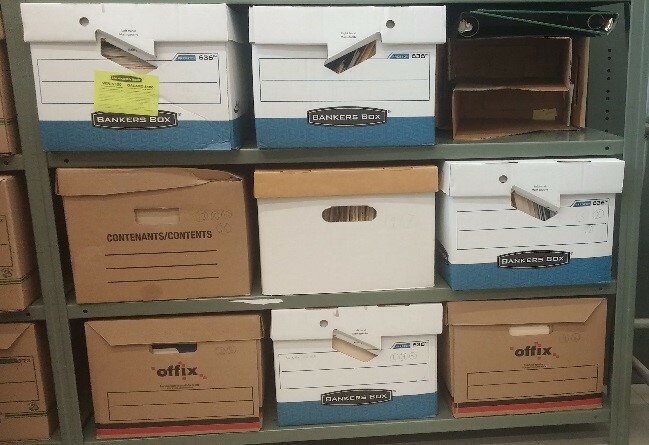 This is not the entire picture, but you can already see that there are many different types of records an archivist has to consider carefully during the processing phase. 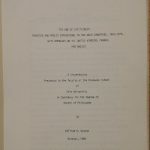 Original PhD thesis titled The Age of Entitlement, 1980. It is an unquestionable fact that professors are the living proof of the establishment’s quality. Men and women alike, reunited under three martlets for the advancement of all sciences. They made history and they will keep being part of it. 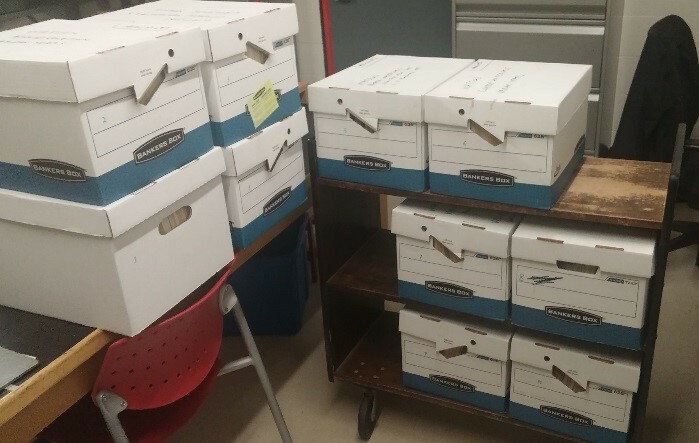 Truly, professors might retire, but their presence, in the form of archives fonds, remains. In fact, they never actually leave our school’s doorsteps. All original material used for this blog entry was pulled from MG4281 – William G. Watson fonds.